Or, you can never have the same traffic-jam twice. Politics is not always about somebody getting his way and somebody else failing to get his way. Consider the case of the Veterans Affairs hospitals: Nobody wanted this outcome. That outcome, recall, is a great many dead veterans, the result of medical and managerial malpractice. Democrats did not want the hospitals that care for our veterans to be catastrophically mismanaged while administrators set about systematically destroying the evidence of their incompetence, and Republicans did not want that, either. Independents are firmly opposed to negligently killing veterans. It doesn’t poll well. Everybody is so opposed to that outcome that we created a cabinet-level secretariat to prevent it and installed as its boss Eric Shinseki, a highly regarded former Army general. We spent very large sums of money, billions of dollars, to prevent this outcome, almost trebling VA spending from 2000 to 2013 even as the total number of veterans declined by several million. Nobody wanted these veterans dead, but dead they are. How is it possible that the government of the United States of America — arguably the most powerful organization of any sort in the history of the human race, in possession of a navy, a nuclear arsenal, and a vast police apparatus — cannot ensure that its own employees and contractors do not negligently kill its other employees and former employees? Never mind providing veterans with world-class medical care — the federal government cannot even prevent bureaucratic homicide. All of the political will is behind having a decent VA, and there is nothing to be gained politically from having a horrific one. How can it be that, with everybody free to vote as he pleases and to propose such policies as please him, we end up with what nobody wants? #ad#There will be plenty of personal culpability to go around as this mess all comes to light, beginning with President Obama, who offered himself to the American people as, among other things, a competent authority on the management of health care. He promised the country openness and transparency but has worked assiduously against those qualities, which carry not only ethical weight but practical value as well: Open and transparent arrangements are much less prone to abuse, especially abuse of the sort that results in death, because observation is linked to accountability, which is why police officers make so many wrongful arrests and destroy so much evidence in response to the perfectly legal act of videotaping them at work. (E.g.) The right thing to do, in response to 40 and counting veterans killed through negligence on his watch, is for President Obama to resign. A man with any self-respect would do it; a country with any self-respect would demand it. But that of course is not what is going to happen. What is going to happen is an epic episode of blame-dodging, evasion, angry accusations, outright lies, indignant harrumphing by mind-killed partisans, etc. At some point, there will be a series of exchanges that can be summarized: “Republicans endorse x policy for Veterans Affairs, while Democrats endorse y policy.” People will have very strong feelings about x vs. y. They will feel so strongly, in fact, that they will forget that nobody endorsed the state of affairs at the VA that preceded x or y, that it was nobody’s policy for the organization to be mired in incompetency and indifference so cruel that it borders on the psychotic. (Gangrene deaths — 150 years after Middleton Goldsmith figured out how to treat gangrene in army hospitals, and our veterans are still dying from it.) It will not occur to very many of the people with a strong emotional stake in that debate that it does not matter whether we choose x or y if that is the beginning and end of the conversation. There is a prior conversation that must take precedence, one in which we answer a more fundamental question: How confident should we be that our policies will produce the desired outcomes? Our political discourse assumes, sometimes implicitly but often explicitly, that there exists a predictable, linear, straightforward relationship between the formal enactment of a given policy and the real-world outcomes that will be experienced as a result of it. This is a convenient fiction, and sometimes even the authors of that fiction roll their eyes at their own work, as when the Congressional Budget Office scored the Affordable Care Act and then added the caveat that its analysts did not believe that the policy would be implemented the way the law’s authors intended and the White House promised, thereby communicating that its report should be consumed only in saline solution. Politics is mostly words about words, but it has real-world consequences, and death is not an uncommon one. The truth, which in Washington is an unspeakable truth, is that almost the entirety of our conversation about politics is predicated on a fundamental error in our understanding of reality. Unlike a certain Entity with Whom presidents and senators sometimes seem to confuse themselves, politicians cannot speak reality into being. (“Let there be . . . health care.”) The situation at the VA should not surprise us; what did we expect, having no way of even knowing what we should have expected? This outcome was at least as likely as any other, and certainly more likely than one in which reality matched policy through some obscure divine office unknown to us. If you want to blame somebody, blame Democritus. Democritus was the Greek philosopher who first imagined the atom, some time around 460 b.c. He thought that if you broke a rock in half, broke one of those halves into even smaller pieces, and kept on going, eventually you would arrive at an indivisible unit of matter, which he called the atom (ἄτομος, “indivisible”). He had a great many ideas about atoms: They are everywhere, eternal, indivisible, always in motion, etc. And the Greek world yawned, and the entire world continued yawning for about 2,000 years. Nobody gave a fig about his atoms. Then, in the 19th century, a couple of Englishmen went hunting for them. First was John Dalton, who was the first to produce experimental evidence for the existence of the atom, and then came J. J. Thomson, who discovered the electron and described the structure of the atom, which he theorized was something like a plum pudding. And then followed a remarkable period: Just a few years after Thomson found the electron, Max Planck discovered the quantum, and five years after that, Albert Einstein published his work on the photoelectric effect. Just a few years later, Ernest Rutherford performed his famous gold-foil experiment and described the atom you know from high-school chemistry class: electrons orbiting a nucleus like planets orbiting the sun in Nicolaus Copernicus’s model of the universe. The unspoken promise is that of reduction: To understand the whole, understand its parts. Understand the atom and you can build an explanation of the universe. Those ideas could be seductive to scientists, but they were practically opiates for politicians. We still hear the unhappy echo of the early-20th-century hymns to totalitarianism in our political campaigns — “How shall we govern? With science!” Copernicus’s neat solar system, Rutherford’s neat atom — with a world that simple, how difficult could it be to shape it to our own desires? But the universe, as it turns out, is not like that, and an atom is not like that, as Niels Bohr set about demonstrating just after Rutherford published his work. It is not a miniature clockwork universe at all, but a fuzzy, not-quite-there, not-quite-not-there proposition, and, adding insult to poor Democritus’s neglect, it’s not even indivisible. Pretty soon you’re into the world of probability clouds and quarks and fermions and other things that will make your head hurt. If your intellectual inclination tilts more heavily toward poetry than physics, you will soon find yourself longing for that clockwork atom and that clockwork universe, neat little non-elliptical orbits and all. And that is precisely why we all have the simple, false model of the atom in our heads. 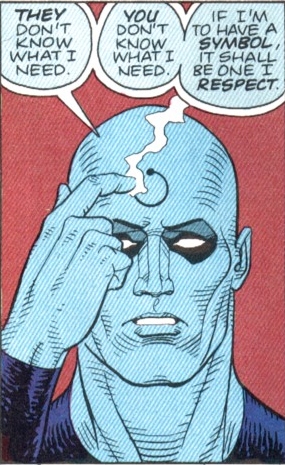 (Or, in the case of Doctor Manhattan, on our heads.) It is the reason we have a simple, false model of the universe in our heads, too. We look at clouds. We dream of machines. The simple, machine-like models of the atom and the solar system are good enough for most non-physics purposes. And even physicists do not have to account for the entire complexity of a given system for every end. If you want to know what a hydrogen atom is up to in a water molecule, you don’t necessarily have to look at it on the subatomic level. You know those subatomic particles are there, but you don’t have to worry about them. For some purposes, and on some level, an atom does behave like a simple, mechanical thing. The behavior of a water molecule is fairly predictable and mechanical; the behavior of a bunch of water molecules in an individual cloud is not; the behavior of clouds in large-scale weather systems is fairly predictable; the behavior of any given rainstorm is not; it gets cold in the winter like clockwork, but any individual blizzard is unpredictable. And that simple mechanical hydrogen atom looks more like a cloud the more closely you look at it. Whether it looks like a cloud or like a machine depends on the level at which you wish to examine the phenomenon. That cumulonimbus creeping across the skyline, and the water molecules that make it up, and the atoms that make those up, and the global weather of which it is a part: a cloud in a machine in a cloud in a machine . . .
represents a slap in the face for traditional reductionist approaches to understanding the world. For example, even a detailed knowledge of the specifications of a car’s engine, colour, and shape is useless when trying to predict where and when traffic jams will arise in a new road system. Likewise, understanding individuals’ personalities in a crowded bar would give little indication as to what large-scale brawls might develop. Within medical science, it is likely that no amount of understanding of an individual brain cell is likely to help us understand how to prevent or cure Alzheimer’s disease. Which is to say, it is showing that the orrery is still only a toy, the clockwork universe an error in understanding. If it seems that we have wandered pretty far afield of the VA hospitals and those dead veterans, we haven’t, really. We’re coming back around to them. #ad#“Similarly,” Stephen Hawking writes, “if you knew it in the future, you could calculate what it must have been in the past. The advent of quantum theory in the 1920s reduced the amount one could predict by half,” and it’s been going down since. Around the same time as quantum theory was being developed, in the field of economics Ludwig von Mises was developing a complexity-based theory of his own, the famous socialist calculation problem — arguing that, without the information communicated by market prices, economic calculation is not inefficient but impossible, and that the so-called scientific socialists, looking down at their five-year plans and their model villages like an archduke playing with his orrery, could not, in fact, actually do what they purported to want to do: rationally manage industries and national economies. Markets, the brain, and weather are among the textbook examples of complex systems, and they have something in common: Their behavior cannot be calculated beforehand. There is no Laplace’s Demon, especially not for human systems. You never have the same party twice, or the same traffic jam. “The behavior of some simple, deterministic systems can be impossible, even in principle, to predict in the long term,” writes computer scientist Melanie Mitchell of the Santa Fe Institute. So, back to my original question: How confident should we be that our policies will produce the desired outcomes? That will depend in some part on how complex the system is that you are attempting to influence. Housing and mortgage markets are very complex, and politicians’ efforts to turn them to their own ends went very badly in 2008, and will go very badly again in the future. Health-insurance markets and medicine are both very complex, and we see how political efforts to manage those have been going. Operating hospitals is a complex business, too. 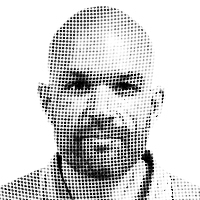 Consider a counterexample: Our food-stamp program has many problems, but imagine what a Hieronymus Bosch nightmare it would be if, instead of the current practice of giving poor people vouchers for food, we applied the VA model and attempted to have the government deliver the service itself rather than simply paying for it. That would mean federally operated farms, ranches, and slaughterhouses, government grocery stores, warehouses, distribution centers, transportation networks, etc., all managed with the competence and decency exhibited by the VA. Rather than trying to politically steer the extraordinarily complex system of producing and distributing food — rather than biting off way more than we can cognitively chew — we instead chose the relatively simple method, giving poor people vouchers for food. Of course that has its problems and unintended consequences, but they are milder than, say, national famine, which is probably what would come of government-run agriculture. We let the complex problem of food production meet the complex solution of the market. Not every regulation or government program is doomed to fail. But we might consider the slightly terrifying possibility that when government does get something right, it does so by accident, temporarily, and for reasons that it cannot understand or replicate. This may be why the sheer volume of law and regulation has been climbing so rapidly: Intuiting its own inefficacy, Washington is throwing everything at the wall and seeing what sticks. The Entity with Whom politicians sometimes confuse themselves needed only ten commandments, not the ten thousand a year that Washington produces. Some of those coming down in the near future will be intended to reform the VA. The rational thing to do would be to abolish it. We’d be far better off paying veterans’ medical bills out of the Treasury than trying to operate a network of hospitals and clinics. And no matter what Washington promises to do to solve this problem, it is a good bet that the policy enacted will not produce the result intended. Reform is a random walk. Another feature of complex systems is that some of them are very sensitive to initial conditions, as expressed by the butterfly effect. It may be the case that things have gone as well as they have for us in the United States not because of any current policy or because of the unique genius and saintliness of our national leadership as currently constituted, but simply because the right people with the right prejudices did the right things for a relatively short period of time in the 18th century, and what we have now is very little more than the compounded returns on that cultural windfall. That seems to me a more likely explanation for our relatively happy and secure place in the world than that we were led to this point by the kind of thinking, and the kind of men, who brought us the VA hospitals and those dead veterans.